What’s Keeping You From Taking Your Seat at the Table? In her book Lean In, Facebook CEO Cheryl Sandberg takes a close look at internal and external perceptions that continue to hamper the ability of some of us to achieve greater degrees of leadership success. While she focuses the discussion primarily on women, the situations, feelings and stumbling blocks she describes can apply to anyone who is interested in pursuing a greater leadership role in their organization. She coins what she calls “the leadership and ambition gap.” Are some of us just less ambitious? Or are we more enlightened with different and more meaningful goals aimed at creating work-life balance between our careers, our families, and community involvement? While she agrees that this desire for work-life balance may affect some of the choices we make, she identifies other areas that she believes may have a broader impact on the issue. One of the key challenges she identified for herself, and that she believes affects many others, is the concern with sacrificing likeability for success—the perception that if you are highly competent and assertive, you are not nearly as likeable and are not a team player. Fear is at the root of many of the barriers to leadership success (not being liked, making the wrong choice, being a failure, etc.). The combination of these factors often leads to a subsequent reluctance to step up and take a seat at the table, both figuratively and literally. Most people really want to be liked—not just because it feels good. Being liked is also a key factor in professional and personal success. So, the challenge is to accept that if you want to be seen as a leader and take on a leadership role, you can’t please everyone and may have to sacrifice being liked by all. Sandberg shares the advice she received from Mark Zuckerberg about six months after she began work at Facebook. He counseled that her desire to be liked by everyone would ultimately hold her back. He said that when you want to change things, you can’t please everyone. And, if you do please everyone, you aren’t making enough progress. She discovered that a way to deal with her lack of confidence about making some tough decisions was the “fake it ’til you feel it” strategy. Projecting confidence, even pretending that you feel confident when you don’t, is necessary to reach for success. These characteristics increase both your likeability and the perception of you as a leader with your colleagues and organizational leadership. And finally, pull up a chair and take your seat at the table. Bad connections are a type of media barrier. By media, we refer to various means or media we use to transmit information. Obviously, a bad connection decreases our ability to effectively transmit information. I started doing some simple math and discovered a shocking truth. If one bad connection causes me to lose 10 seconds of productivity each hour, that equals 80 seconds per average workday. That means one bad connection costs almost 6 hours of productivity every year! If I have 20 employees on my team who are having similar issues with a phone system, software package, copy machine, etc., then my organization is annually losing 120 hours of productivity due to bad connections. Many times, employees learn to live with idiosyncrasies of various technology tools. We wait on the copier. We adjust to the bandwidth. We live with the dropped calls. These bad connections may not seem like much, but when we do the math, we may discover that our time-saving tools are actually costing us more than we realize. So, how can we mitigate issues associated with bad connections? If you have access to a hardwired device, use it. Although no piece of technology is going to run at maximum efficiency 100% of the time, the likelihood of a hardwired connection maintaining signal strength or bandwidth is much greater than a wireless device. So, if you have a call to make from your desk, use your landline instead of your cell phone. If you are working online, use a hardwired versus wireless connection. Perhaps some day, this won’t be an issue, but we’re several years away from wireless signals having the consistency and dependability of hardwired connections. Since wireless connection is rapidly becoming the norm due to the increasing use of tablets and smartphones, make sure you keep IT informed of any bandwidth issues. If you are having trouble with bad connections, report it. Your supervisors can’t know what they don’t know. My hunch is if you are losing six hours of productivity annually, they want to know! Let IT take care of IT issues. Several years ago, I saw a sign on a plumbing business that still makes me grin, “We repair what your husband fixed.” How many times has someone in your workplace taken an hour to do what someone in IT could do in 10 minutes? Taking a few seconds to send a request to IT may save you several hours later. We would love to hear any additional productivity tips you have to offer. Just list them in the comments section below. If there is something you know that others do not know, and they should know (and they probably should know mostly everything), and you don’t tell them, then you have failed to communicate. Let’s call this the “I’ve kept my mouth shut too long” problem. Whenever an employee or a member of a group says, “I wish they would not keep me in the dark,” this reflects this particular failure of communication. Once you know something—anything—that needs to be communicated, communicate it! You say the wrong thing. You know those times when you write an e-mail and hit send too quickly, or when words come out of your mouth and you wish you could grab them back? Call this the “say the wrong thing” problem. If you say the wrong thing, you have failed to communicate effectively. It really is better to say nothing than to say the wrong thing. You communicate with words, ideas, concepts that your audience/readers do not understand. Sometimes, you have such a deep and quick-to-fully-grasp understanding of words, ideas, acronyms, etc. that you just assume everyone else understands what you understand. Call this the “too much jargon” problem. You think those receiving your message know what you know. Many times, they don’t! Becoming a much better explainer (“this is what I mean by the use of this word, this acronym”) should become a regular part of your communication strategy. You assume that one communication (one telling, one saying, one writing) is enough. It isn’t. It never is! Whenever you think or say, “I told them; I sent them an e-mail; I left a voice message, so I have communicated…” you think you are now absolved of all responsibility. That is a big mistake! Call this the “I told them—how can they say I haven’t communicated” problem. People are busy. They get lots of e-mails. Their mind is distracted in multiple ways during meetings and presentations. Don’t ever feel too put out with them for “missing” your message. (You’ve missed a few yourself a time or more). 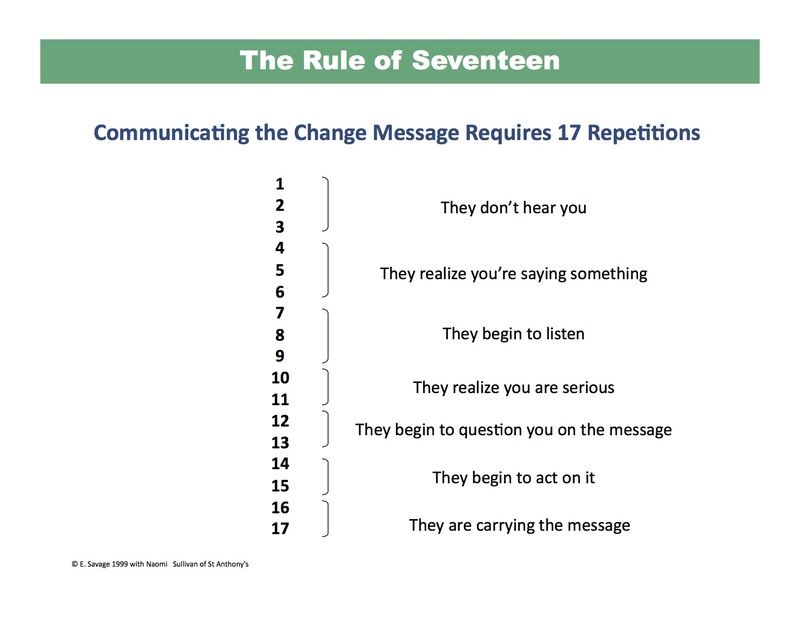 Remember The Rule of 17—it takes repeating a message 17 times before you can say you have “communicated” a message. Sending a message is not communicating. You have not communicated until the receiver receives the sent message. We’re continuing our series in the Cookingham Connection with a perspective from an emerging leader in local government. You heard what a city manager had to say about Cookingham’s 1st guidepost. Now hear it from the lens of Emily Leuning, an intern for the City of Sherman, Oregon and the City of West Linn, Oregon. Never forget that the council, to the best of its ability, expresses the will of the people. There will be times when you will not understand why the council takes certain actions, but you will find that the council is generally right, and the members express public opinion as they see it and as they learn it from their constituents. The council’s ability to make the best decision may be hampered by a number of things: lack of representation, complicated city code, concerns about re-election, etc. To me, the most significant of these is the fact that councils don’t often reflect the community they serve. How many councils today consist solely of white, middle-aged men of a certain socioeconomic status? Or have seven members, two of which are female? Are any of the communities they represent all male (or 5/7 male)? Political representation at all levels has certainly improved since 1956, but that doesn’t mean that the job is done. The final part of this guidepost refers to council members expressing public opinion “as they see it and as they learn it from their constituents.” However, unless the community is extremely small, there is no way that council members are definitively able to know what their constituents think about a particular issue (of course, there aren’t too many examples of governance by direct democracy outside of recalls and referendums). Granted, most city councilors have lived within the community for years or even decades and likely have a general idea of their constituents’ psychographics. However, it seems to me, based on my (admittedly limited) knowledge of city council meetings, that the citizens who show up and get involved in the city council process are usually those who are very much for or against a particular project or referendum. Citizen input is a fundamental component of the process, and again, I suggest that increased representation would help the council improve the quality of its decision-making. Find a way to get input from people who don’t have time to attend council meetings because they are single parents who can’t afford a babysitter. Find a way to ascertain what the college students and recent college grads think about the issue. Find a way to get people involved who have traditionally been left out of the decision-making process. When a broader range of people get involved, the councilors hear from a wider range of citizens and opinions other than the passionate pro and con can be explored. Personally, I would like to have been part of the Portland City Council back in April because of this gem I came across in the council agenda: Request of Barry S. to address Council regarding living from the outside of planet earth. Define Reality. “Oh, that’s vision.” Check. Welcome to week one of the Cookingham Connection! This week, we hear from Chris Jordan, the city manager of West Linn, Oregon. Chris Jordan began his tenure as City Manager of West Linn in October 2005. For the previous 10 years, Mr. Jordan worked for the City of Lake Oswego where he was the Assistant City Manager overseeing several departments including Finance and Parks and Recreation. The Cornell University graduate also spent nine years working in Washington, D.C. with the White House’s Office of Management and Budget. When we choose a career in the public sector, we all need to recognize that the final authority rests with those who have the votes: in elections, it’s the voters at the polls, and on legislative items, it’s the legislators themselves. In local government, that’s the City Council. In our role as city managers or city staff, we not only need to understand this relationship, but always take action that reflects our support of it. Does that mean that we will always agree with our councils? Of course not. Just as all members of our council won’t always agree. But, we must support the process that leads to the decision, and we must support the outcome. In his statement, Cookingham mentions that “you will not understand why the council takes certain actions.” I would disagree with this. As city managers, we may not always agree with council decisions, but we should certainly understand the decision and the reasons for the action. It is our job to have a good feel for the priorities of our councilors and communicate with them enough to understand the rationale behind their decisions. We may be surprised from time to time, but we should understand the decision. Cookingham also states a council’s decisions are “generally right.” I would agree with this, with a caveat: when setting policy, I don’t believe in “right” and “wrong” decisions. I believe that there are better and worse decisions, but right and wrong rarely happen. This, in part, is what makes our jobs so challenging: educating volunteer councilors of the subtle nuances and implications of the decisions they are asked to make when there is no clear right or wrong decision. However, Cookingham is absolutely correct that most council decisions prove to be better than what we may have anticipated. There are numerous occasions where staff will make a recommendation only to have the elected officials choose to go in a different direction. I would recommend not necessarily attempting to evaluate the merits of any singular decision, but every few years reflect back on the entirety of the decisions of a council, and I’m confident that what you will find is that these decisions have moved the community in a positive direction. And, part of that, is the long term political viability of those making the decisions which, hopefully leads to a positive, trusting relationship between the municipal government and its constituents. For example, my city had the opportunity to host a large transportation sustainability initiative. As exciting as this project was for staff and many in the community, there were others who looked at it as an inconvenience that would not directly benefit the community. After one contentious meeting on the topic, I spoke with members of the Council, and although I believe some may have been convinced to support the project, we decided not to pursue it further. Was this disappointing? Yes. But to the Councilors, approving the project would have meant significant political opposition for them, and a huge distraction from the Council’s other goals. We’ll never know if this was the “right” decision, but we do know that we have a very stable council with a trusting community which is a very positive outcome from all the decisions the Council has made. Ultimately, we all benefit from that relationship. Today is the launch of a blog series we’re calling “Cookingham Connections.” Laurie Perry Cookingham is who some people call the “Godfather of City Management.” He pegged 22 guideposts for city managers to follow—and his suggestions can still be applied today. Strategic Government Resources (SGR) is partnering with Emerging Local Government Leaders (ELGL) in this project with the hopes of bridging the generation gap in local government. Each week, you’ll read blog posts about one of Cookingham’s 22 guideposts— one through the eyes of a city manager, the other through the eyes of an emerging city management professional. We hope this blog series will help both sides of the spectrum gain insight that will ultimately cause all to become better leaders. Below is a brief introduction to this L.P. Cookingham blog series, written by a city manager who learned from Cookingham’s examples. L.P. “Perry” Cookingham, “the Dean of City Managers,” was a legend in the city management field. If you haven’t read about Mr. Cookingham, he is just a Google search away. He served as a city manager in three Michigan cities in the mid 1920s to 1940. He spent his most influential years in Kansas City, Missouri from 1940 to 1959 where he rose to national prominence. He then finished his career in Fort Worth, Texas in 1964. A closer look at Mr. Cookingham’s life and career reveals that he had great insight into the foundation of our profession. His thoughts—as portrayed by newspaper articles, books, speeches, and articles he wrote—demonstrate his acumen on a wide range of issues we all deal with in City Hall. Mr. Cookingham provides guidance and thoughts on the role and responsibilities of the different players in the municipal landscape; how to harness the varied power centers that exist in all cities to accomplish our work; the need for a manager to grow and change to stay current with the times; the importance and knowledge brought to bear on problems by a truly professional management team; the power of ideas that come from proper and thoughtful analysis; the need to invest in long-range planning; sustaining council/manager relations; the need to treat everyone in the city (friend or foe) with the respect and dignity they deserve; and the list goes on and on. I encourage you to read the upcoming blog posts and spend some time learning about Cookingham. His example will make us all better managers, and with a bit of luck, maybe “Cookie” (as he was called by his friends) will make us better people along the way. Meetings. Just the word alone can make a room cringe. The word gets a bad rap—not because meetings aren’t good a good thing—but because people don’t know how to conduct a proper one. This is what I like to call a Meeting High: the feeling of euphoria after having a meeting that dismisses with everyone on the same “hoorah” page. But days later, the high starts to wear off and ideas are forgotten. All those great concepts become a distant memory because a very important step in most meetings is lacking—a call to action. Which ideas are staying? Who’s in charge of implementing them? When’s the deadline to see progress on each of the ideas? Without delegating the next steps to ideas, they’ll never come into fruition. Luckily, we have people on our team who take initiative and get the ball rolling on their own; but not every organization is fortunate enough to have that. Don’t waste another meeting on empty talk. Be ready to take the next steps to put that talk into action. Schwartz wrote those words almost 25 years ago, but the truth in his observation has not changed. “Listening” is a doorway to remarkability. Surely, some leaders achieve “success” by luck, others by pretense, and still others through less-than-ethical means. But, ask any leader of substance to name a list of key factors that contributed to his or her success, and active listening will almost always be in the mix. I would argue that culturally, we are facing a listening crisis. Many seem to prefer talking over listening; and while talking is an effective aspect in an interpersonal communication cycle, to talk much and listen little may make remarkability an ever-elusive reality. So, how can leaders graduate from ordinary to remarkable? Remind employees that listening is an action verb. Avoid giving advice before you have the complete picture. Avoid checking your watch, phone, tablet, etc. Remain civil in all conversations. Listen to ALL your employees. If you only listen to a select few, you may find that the only people you are listening to are the people who tell you what you want to hear. Obviously, we could go on and on with a “listening tips list,” but let me add a final criteria that is often overlooked. Since listen is an action verb, that means we as human beings can increase our listening capacity. As with any action, the more you practice, the more natural the action becomes. So, practice! The more you listen to others, the more they will be willing to listen to you. In other words, you’re just an action verb away from being a remarkable leader. We’ve pretty much heard enough on this by now. In a world of shoddy and unpleasant and inefficient design, attention to detail is a big winner. But, in order to be good at it, you have to actually be attentive to detail… every detail… every little tiny detail. You can’t be attentive to the big details without a lot of practice at being attentive to every small detail. One detail at a time—that is the secret. The person who makes the bed every day, properly (no, I doubt that I have ever done so even once in my life to his standards), is likely to pay attention to a whole lot of other details. We could make a long list from the life of Steve Jobs. He obsessed over every detail. He insisted that the inner workings of the first Mac “looked right.” Others complained, “Who cares what it looks like, as long as it works.” Such disregard to design detail was not in Steve Jobs’ DNA. This man spent a day at a jelly bean factory looking carefully at colors for the first iMac. He was not going to let any detail slip by him. Now, some of us have grown so used to—so satisfied with—inattention to detail that we can hardly see such inattention. So, we’ve got to learn a new skill. Let’s call this the “learn to pay attention to detail” skill. And then, once we spot the miss, the shoddiness, the error, the mistake, the less than “at least close to perfect” slip up in execution, or in design, we can then get to work to set it right. Learn to pay attention to detail. If you don’t, the company and the person who does pay attention to detail will leave you behind. It’s definitely a “pay attention to detail to win” era.